So, just got a used (but like new) Marshall YJM, which is a signature amp (Yngwie Malmsteen). While I never cared for Mr. Malmsteen not even for two seconds in a row (with Respect), I love the amp. It is basically a regular Marshall 1959 Super Lead, 100 watts amplifier (which is my favourite amplifier type in the world), loaded with additional features that the vintage ones don’t have. Including a boost, reverb, noise gate and embedded attenuation via a modern “EPA” electronic circuit that lowers the voltage going to the main (EL34) tubes thus reducing the output up to bedroom levels. I immediately tried the EPA function, which didn’t strike me as the best attenuation method available – it lets the amp drive way less and subtracts high frequencies, at least compared to my Aracom. Expect a much better review of this soon – I am very interested in the differences between new and vintage amps, attenuation technologies and tone in general (you knew it didn’t you). I think these right here are all the necessary tools for us bedroom rockers, and I will not stop investigating. Edit: after speaking with friend CrossroadsNYC (moderator at the marshallforum.com) it turns out that these are known characteristics, and it is just normal for the EPA to behave like that. I still like my Aracom a number of times better, however keeping in mind that the Aracom is a few more hundred bucks and the EPA is included with the amp… you know the math. I made this little AC/DC copycat thing this morning to let you have a grasp of what the YJM sounds like. All parts played with a 1967 Gibson SG Standard (the one that was recently repainted), stock pickup (which I don’t even know if it is a t-top anymore, it came with the guitar and it is rather old). 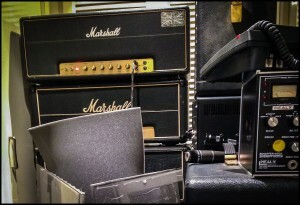 Cabinet is a Marshall B type with vintage 1970s G12Ms “blackbacks”. Microphone was my newly acquired Neumann U47 FET (god I love it). The two guitars on the sides were played with NO TSR; the solo in the centre was played with TSR in standby for its first half, then TSR on (you should be able to tell when this happens). The Marshall YJM settings were P0, M4, T6, V4 (yep, voume on 4), attenuated with my Aracom. Guitar volume and tone both on 10. I have a yjm100 too. I found the same thing with the EPA – it doesn’t allow you to get the full gain from the amp. So, I use the Marshall pb100 and the YJM and it sounds stunning. I then add a clean boost for solos to hit the input harder. Perfect tone for me!!! I don’t use an attenuator, I still use the EPA which improves as you turn it up, but at low levels I don’t like it at all. I haven’t compared the YJM with a 1959 side by side but my Suhr sounds more organic than the YJM. I’ve got a YJM which I play through a 70s cab with Blackbacks and in my opinion the EPA is not that useful, it drains away the gain and any organic qualities the amp has. However when you turn the thing up it sounds way better and I can get a pretty good old fashion Thin Lizzy rhythm sound. I’ve not had a chance to play the amp live yet but I feel in a live situation with the amp open and breathing it could sound pretty effective. When I use the boost a little of the bottom end disappears. I currently got a Suhr SL68 which has a very good Master Volume and seems to work much better than the EPA. In my opinion this amp comes closes to the Plexi sounds I used as a kid but all at a manageable volume. As much as I love sound and tone of vintage marshall amps and have tried out the YJM out severel times this actually is a very expensive hobby… So to get the 1959 tone I bought the chinese made bugera 1960 infinium which has some of the same features as the YJM and is 1/5 the price. I actually think it sounds pretty decent. Now, I don’t have the equipment to make a decent recording of the amp so it would be fun if you would make a review of the bugera for all of us mortals with kids, mortgages and wives who don’t have thousands to spend on gear… By the way, I did manage to put aside enough to buy a 1977 jmp 2203 that absolutly rocks! There’s a video by wilson that shows the 1960 head being used with TSR. https://www.youtube.com/watch?v=A65_a4h0pms#t=54 Sounds pretty damn good for 400 dollars. Yes, I have seen the videos he put on youtube… Love the tone when he plays Landslide! And he actually plays with a bugera cab as well… This is why I think it would be awesome if Fil made a demo of the amp with his aracom, neumann and a cab with g12-65’s… I’m pretty sure that would sound amazing! Thanks guys for the great comments i appreciate it :). I really think the bugera 1960 is a great amp for the money. My amp is the first model of the 1960. My friend modded the LAR/MAR post phase master volume in it and we pulled two tubes out of it to get quicker break up. JJ Tubes were installed in those videos. Everything else is all stock. Kent! I am with you. I think that expensive gear is too often overrated. In fact, I stick with old stuff, almost exclusively bought second hand etc. I don’t know the Bugera in question (and I will research it) but if the circuit is even just similar to the 1959 model (copied off of a Fender vintage bassman) and/or a Marshall 2203 (an “evolution” of a 1959″) then it’s my kind of circuit. I still stick to that old of a circuit, I haven’t changed and it doesn’t look like – at almost 50 years of age – I am going to (laughs). Clones of such amps can be had at “just” a few hundred bucks, especially if – again – bought second hand. It’s my kind of thing. The bugera 1960 is almost dead on a 1959 circuit and the follow up called 1960 infinium which I have, is the same with extra features like ppimv, rr-mod, loop, autobias and patched channels build in… Actually a cheap alternative to the YJM100. I do love the YJM, I think it sounds killer! The bugera does not sound that different though, a bit thinner, but I suspect that might have something to do with the ppimv vs the epa. I have just bought a used hotplate so I’m very excited to hear the difference! I also heard that if you change some of the bright caps and some other little things that it sounds a lot better than it does stock. Yep was just checking the Bugera specs; looks like a 1959. For the record, I like way more PPIMV than EPA. EPA I dislike much – but I only tried mine at the same levels I use my Aracom, that is, almost bedroom level, VERY quiet. My experience with PPIMV was always better than this. I would not hesitate 5 seconds in choosing a Bugera as a 1959 model. I just think the stock ppimv on the bugera looses a lot of bass response. And the eq does not work very well with the ppimv engaged. But it’s better than being blown out the window! Damn good playing in this little demo! Hows it going for you my friends. How is that YJM100 going for you? Ok, I’m emailing you an email that i sent to solo, as i have come across some people with issues with the YJM amp, and as of a couple of days ago my YJM100 blew up! Its “was” no more. Ok what happens to the YJM100 is that the inbuilt boost chip which is located on the rear board inside the amp, has a run of the mill overdrive chip in it, (RC4558 chip) same as used in 90% of all overdrive pedals and boost pedals and some distortion pedals. The chip is used in the boost circuit of the amp and maybe even the noise gate aswell. What happens is that when you use “too much boost” into the front of the amp, aswell as the built in boost, this chip gets overloaded, and will have a melt down, i.e. it will blow and no longer work properly. The symptom will be input number one on the bright channel, i.e. where the boost is wired into, will become dull, as if you have lost all treble functions, and the treble knob will almost have no effect on the tone, i.e. the amp will sound like a bass amp. If you plug into the lower inputs at this time, where the boost isn’t wired into, you will get the treble back but far less drive now, it will seem. This has happened to a number of people, and i found the cure which has worked for all others using this cure. I found the cure from an electronics guy who fixed the YJM100 for someone. What you do is simply replace that chip on the rear board, which is easy to find. Its right there at the top far left behind the boost knob in side the amp, just under where the cable plugs into that rear board. You can either simply replace it with a stock RC4558 chip which is SMD, surface mount, or go the way i went, and that was to replace it with a full size stronger JRC4558D chip, just like in most vintage TS808 pedals, (or within my JD Screamer pedals i build). They are the same tone and function chips. May or may not be any better, but they are the same function when in operation. Just as easy to get another surface mount and solder it into place, all done. This was great food for thought as you will never have to send the amp into a tech to fix this issue. This very issue may pop up at some point for any one of you YJM100 owners since you are loading up the already hotrod YJM amp with the hot schaffer replica. I believe it was because of the chip being weak ish, but also by using the schaffer “AND” other drive pedals at the same time, and this overloaded a weak area in the amp. I believe that the built in booster is quite hot, and along with the schaffer “at the same time” and the front volume knobs over half etc etc etc, who knows, but that is the overload situation for many users. Its all good news anyhow, as it will save stress when you blow the YJM and think you have done more than a simple issue like this. The fix costs 40 cents, thus, very good news if you know how to use a soldering iron. Sounds good! 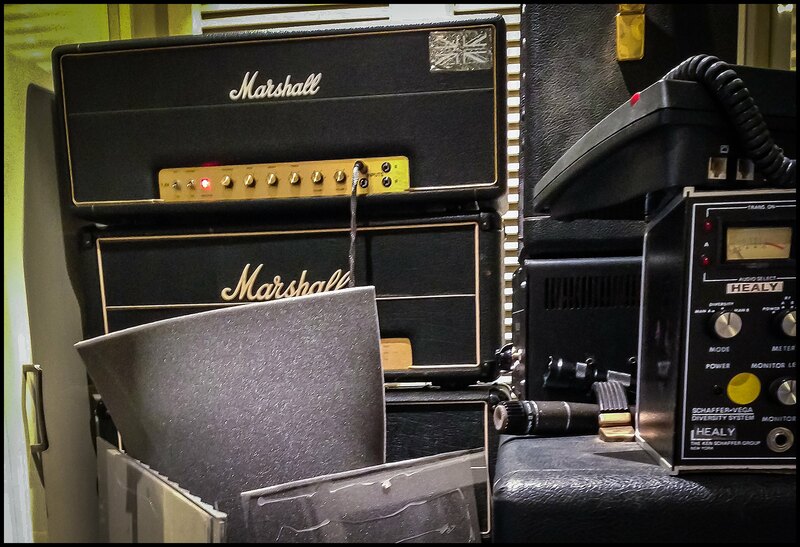 It would be nice to hear a recording of a Marshall that us mere mortals can afford (ie JCM 900 or 2000) trying to get a similar tone. All the demos I find of these amps (mostly on YouTube) are horrible. Jake vintage JMP amps are actually not much more expensive or more then a jcm900-2000 in most cases if you look in the right spots. I have noticed them being alittle more in parts of the world that are harder to get but in canada and U.S you can get a jmp for 800-1100$ any day of the week if you no where to look and a jcm 900 goes for 650-1000$. Don’t forget JCM 800 amps as well which sell for same prices as the 900 in most cases and there great amps as well. This is simply amazing! Just for those with a sense of humour AND AN OPEN MIND. TURN THE VOLUME WAY UP AND BE AMAZED!!! Is it just me, or does the solo have a little bit “squeakier” of a top end? The top end of the amp definitely sounds very open. While it still feels very Marshall-y and brown, its a bit of a different flavor. Do you mind me asking what you paid for it (ballpark figure)? I thought these were supposed to be a gajillion dollars. Still its sounds really good got ACDC Vibe all over it!! After thinking a lot about it, i have sold my beloved 2210 to fund the YJM100 last year. Hey Fil, this is awesome. Had confirmation from Jeff at Aracom yesterday that my DAG is en route. And as soon as one shows up, gonna go for a 59HW. Its heartening to know you prefer the Aracom to the Power Scaling on the YJM after reading recent comments on the other thread. I had an amp fitted with London Power scaling a couple years back and never really liked it compared to the built in PPIMV or my THD… I think the power valves and OT need to work hard for their living. Was thinking of getting a YJM too, but then a 1970 1959 ran almost over my feet. Build date 2 weeks before by birthday Great team with my Aracom too. By the way, where do i find drum backingtracks like this? Online – this was online years ago (it’s the drum track of highway to hell 😆 ) – added the backing track to this file below the previous one for you guys if you want to jam to it! Oh thats the reason why it sounds so familiar to my ears :D! yes you do need to get one. I have had the fixed or (lowered output) gold tag now for a week or two and its now a built in feature of my YJM, even though the YJM sounds simply bliss on its own – the boost is nice in it already. Even though one jumps back on the old vintage 1959, for some reason, you quickly gravitate back to the yjm as your mainstay playing amp, got the tone, and dam handy having those built in features. Gee i really, i really hope that someday i will get that close to such a good playing. You should setup a band ans sell these records. Awesome Job! Sounds great and any marshall in your hands is going to sound great!!!!! !